Why not make your own earrings, rings, pendants, bracelets, hair clips, key chains, or decorate your cell phone, your monitor, picture frames? Or sell them online? 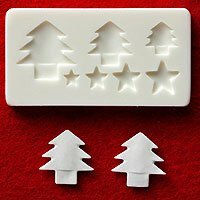 This mold will help you make beautiful pieces. This high quality and very detail mold is for making miniature clay item for decorations. May be used with any type of air-drying clay, polymer clay, or metal clay. Apply corn starch to the mold before application. Using a needle will make it easier to lift the clay. Please do not hesitate to contact me if you have any question or concern, it will be my pleasure to assist you in any way I can. I am happy to combine shipping charges for multiple items. Just contact me regarding multiple items and I will setup a discounted shipping cost. I will try my best to earn your business. Your satisfaction is my utmost priority. I will ship your order usually within one business day after the payment received. Email me for shipping cost if your country is not listed. New products are added daily so check out my store and take a look around.